"Your Chamber team, President and Board members are freshly returned from Anzac Day commemorations in Hellfire Pass and Kanchanaburi. This year’s experience made all the more poignant by the remarks provided by two remaining POWs, Neil MacPherson OAM and Harold Martin, aged 94 and 99 respectively. The report and photos from the annual Chamber tour will appear in next month’s eAdvance. We are currently in the middle of administering the second annual Business Survey – the primary contact listed for each corporate member has been sent the link to a short 5-7 minute survey with responses requested by Friday 29 April. The 2016 Business Survey is a joint project with fellow AustChams across ASEAN with the goal of gaining a unique ‘whole of ASEAN’ perspective on challenges for foreign business and feedback on the newly formed ASEAN Economic Community. If you have not yet completed the survey we request your assistance to ensure that the perspective of business in Thailand is represented in the final report. Nominations for the 2016 Australian Alumni Awards are also now open. Sponsored by the Australian Embassy Bangkok and Chamber members Mitr Phol, dwp and Bumrungrad Hospital, the awards recognise excellence in professional achievements in four categories. Details about the Alumni Awards and nomination information can be found at www.australianalumni.com . Over the coming weeks we are excited to bring you some great events, starting with a presentation by Alan Polivnick, AustCham Board Member and Partner at Watson Farley & Williams (Thailand) Ltd and representatives from Grant Thornton on the Legal, Tax and Statutory Obligations of Directors in Thailand. A topic of interest to most members, at the time of publishing there were only a handful of remaining seats available for this popular presentation. It will be followed by May Sundowners, making a 2016 return to Crowne Plaza Lumpini whose reputation for standout hospitality under the stewardship of Australian Area General Manager Sam Davies is well deserved. Also in May, we will be assisting the Bangkok River Project and Australian Embassy Bangkok with Creating Cities: Co Create Chareonkrung. Of interest to all Bangkok residents, visiting Australian Marcus Westbury will share his experience breathing new life into a previously tired area of Newcastle while local Thai guest speakers will provide an insight into the ongoing work to build a creative district and revitalise the Chareonkrung area. Registrations for this free event are now open and we encourage anyone who has an interest in the historic riverside area to attend. Finally this month we extend a special congratulations to ANZWG who are about to launch the 20th Edition of the Bangkok Guide. An incredible milestone, the Bangkok Guide continues to be an invaluable resource to the expatriate community in Bangkok. In this month’s Must Watch we have included a recent TV News Report from New Zealand about the work and achievements of ANZWG and their continuing support to Australian Sister Joan and her mission to help improve the lives of underprivileged communities in Bangkok. Well done ANZWG and Sister Joan, the international recognition of your achievements is well deserved! " This afternoon session is intended for Directors, those who are thinking of becoming a Director, in-house legal counsel and compliance officers or even finance professionals who would like to have an update of the latest legal and statutory requirements for Directors. AustCham invites members and friends to join May Sundowners to meet, network and enjoy the outstanding hospitality of Crowne Plaza Lumpini. The Crowne Plaza Lumpini is located in the heart of the vibrant Silom neighbourhood, a short walk from Saladang BTS Station or Silom MRT station. Creating Cities: Co-Create Charoenkrung is an opportunity for international visionaries who have had remarkable success in their field to share their story with local government and business leaders, teachers and students, and those interested in a better way of life. AustCham is delighted to invite members and guests to participate in a boardroom breakfast briefing to discuss the outcomes of the 2016 Budget and the latest Australian Tax and Superannuation matters for Australians living in Thailand. Australian based AustCham members MMT Financial Services are specialists on taxation, economic and investment advice for Australian expatriates. During upcoming travel to Bangkok, Stephen Caswell and Stephen French will chair a boardroom briefing for AustCham members and guests. Energy consumption in developing Asia is projected to increase sharply as the region’s economies continue to grow at a rapid pace. This hunger for energy will be driven in part by low-priced oil, gas, and coal, the dominant sources of electricity production and industrial expansion. However, subsidized fossil fuels encourage their fast depletion and are a major source of greenhouse gas emissions. Moreover, cheap energy benefits the poor the least, while richer classes, benefiting the most due to their higher energy consumption, belong to powerful lobbies that block energy reforms. The rationale for fuel subsidies reform is to discourage energy overuse, reduce the need for energy rationing, improve economic efficiency, and lessen fiscal vulnerability. This study assesses the extent of fossil fuel subsidies in three Asian countries—India, Indonesia, and Thailand—and projects the impact of their removal on those economies, households, energy use, and environmental pollution. Over the past six months I have constantly made reference to the fact that we are in a low interest, low return, and volatile investment cycle; but what does this mean for investors, particularly those who see themselves as conservative? The Asian Development Outlook, popularly known as the ADO, is a series of annual economic reports on the developing member countries (DMCs) of the Asian Development Bank. The ADO features an assessment of economic trends and prospects for the world and for the developing economies of Asia and the Pacific, economic profiles, economic management issues, development policy concerns, and economic projections, for the DMCs of ADB, and a theme chapter covering important issues confronting the region. Dad's time on the Burma Railway was the formative experience of his life, and those years and those stories and the lore that developed have been part of my life too, and in no small way, have helped make me the man I am today, writes Matthew Abbott. The Department of International Trade Promotion, Ministry of Commerce, in collaboration with the Thai Chamber of Commerce and Koelnmesse present the second biggest event of its kind in Asia - “THAIFEX -World of Food Asia”, showcasing Asian food products. An Australian being recognised with an Order of Australia for his commercial work in Thailand, says the efforts by many Australians working overseas often go unrecognised by organisations back home. People making less than 26,000 baht a month on average will be tax-exempted under a new personal tax income structure to take effect in 2017 for 2018 filings. When you consider the backdrop of weak global demand, a faltering Chinese economy and uncertainty over American monetary policy, then the predictions for South-East Asian economies appear quite upbeat. Of the ten countries in the region, only tiny Brunei is close to recession. Indeed the Asian Development Bank (ADB) forecasts that growth in regional GDP will climb from 4.4% last year to 4.5% this year and 4.8% in 2017. But hold that backdrop in mind: such forecasts may prove too optimistic, especially if global financial markets get another bout of jitters like those earlier this year, and foreign capital is pulled out in a hurry. Nominations for the 2016 Australian Alumni Awards are currently being accepted. The Australian Alumni Awards recognise the significant achievements of Alumni members who have graduated from any Australian University or other institution of higher learning and whose endeavours reflect the best of Australian education. Deadline for nominations: 5pm Friday 13 May, 2016. Convoy for Kids, first started in the year 2000 and was formed by the transport and logistics companies which made up The Logistics Sub-Committee of The Australian-Thai Chamber of Commerce at that time. The group aims to put some fun into the lives of handicapped and under privileged children as well as give them some financial support. 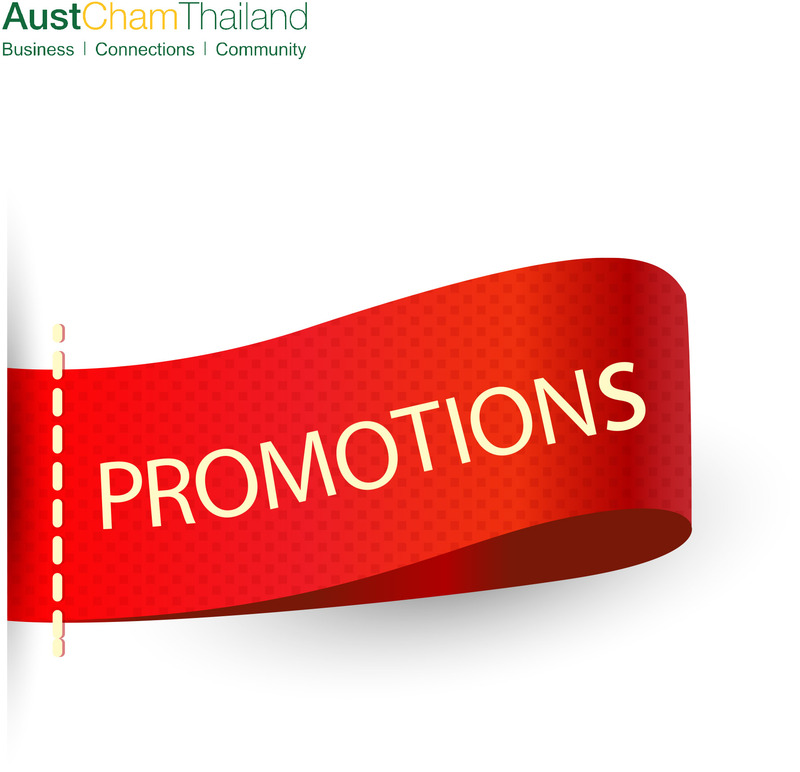 Discover a variety of promotions and good deals from AustCham members. SO Sofitel Hua Hin is an artistic adventure though the Evolution of Life, designed by award winning architects, designers and enhanced with signature fashion designer, Polpat Asavaphrapa. The journey unfolds at the moment of arrival at the geometrical landscaped courtyard and progresses with every step, through the open-air lobby and the interwoven maze of open courtyards and private pathways filled with hidden art and animal figures waiting to be discovered. Situated beachside with a 2-hour drive from Bangkok, the resort has 77 rooms and pool villas split into two distinct styles: SO Arty and SO nature. New Member - Thai Light Gauge Steel Co., Ltd.
Thai based light gauge steel is framing and engineering company which import key technology from New Zealand and Australia to manufacture high quality light gauge steel structure. We can supply our customers with wall frame, roof truss, and floor joist produced from highly advanced Scottsdale construction system CNC. In addition, we also import other building products such as building wrap from Australia. The Bangkok Cleaning Company is Thailand's premier cleaning consultancy. Innovative and technology based solutions combined with a proactive client-service mentality enables The Bangkok Cleaning Company to deliver first-class cleaning solutions to some of the world's largest and most respected brands and businesses. Editorial contributions to Advance Magazine are welcome. Unsubscribe and we will promptly remove you from our mailing list.